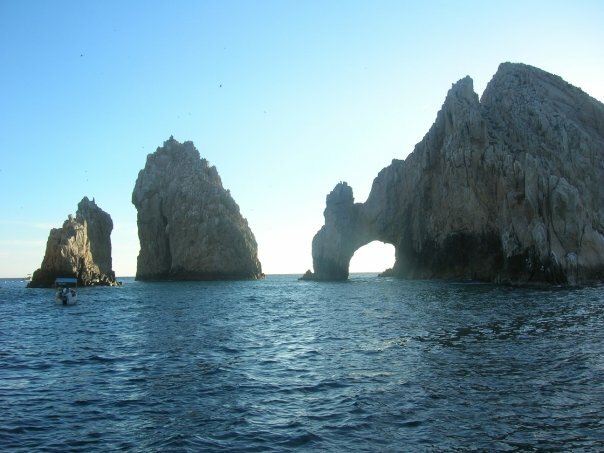 One day, Hubby and I were actually able to get our butts up and head into Cabo San Lucas for a day. The hotel we stayed at, Cabo Azul, is located in San Jose del Cabo so we took a shuttle into town. During the ride, I tried to get a glimpse of all the mega resorts we were passing by but couldn’t see much from the road. The shuttle dropped us off at the Puerto Paraiso mall, which is pretty much the central tourist spot in Cabo and borders the marina. We walked along the marina, got bugged by street vendors selling (probably fake), and had lunch. 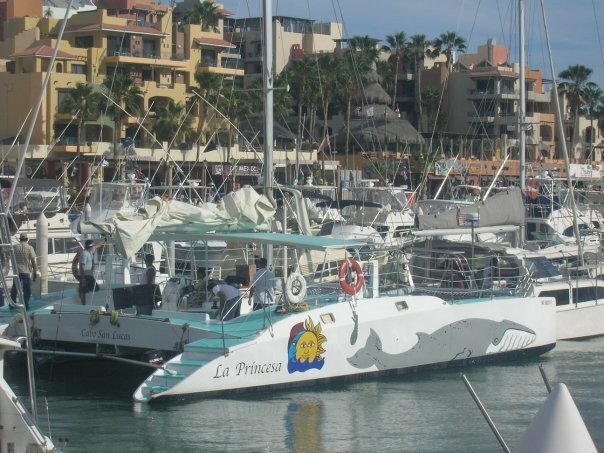 It was then time for our sunset cruise with La Princesa,which we had booked through our hotel concierge. The sunset cruise was a blast. The crew on the boat was entertaining and fun, drinks and snacks were provided, and the views were great. 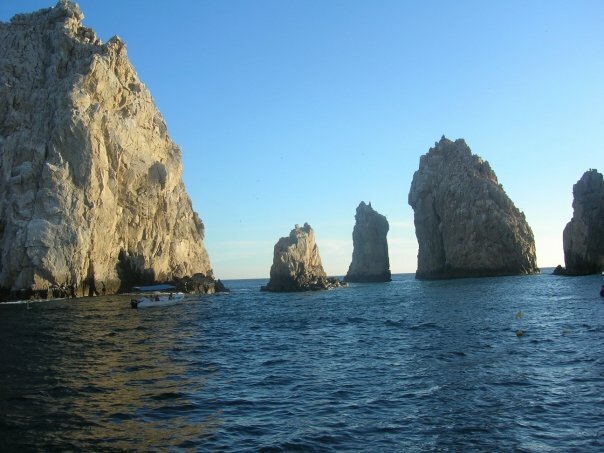 The Arches, giant rock formations rising out of sea, are probably Cabo’s most famous tourist sight. The captain pointed out Lover’s Beach, a stretch of beautiful sand near the Arch which anyone can visit, as long as you get a boat to take you there of course. The catamaran went through the waters pretty fast, allowing us to get splashed with water near the edges of the boat. Hubby absolutely loves sailing so he was just having a fantastic time being on the water, drinking Coronas, and watching the sunset. We were both so happy that we even purchased souvenir photos (which I look super cute in I might add). After the cruise, we just walked around the marina some more, stopping by a place for dinner and more beer. The most famous nightlife spot in Cabo is, unfortunately, Cabo Wabo Cantina from rocker Sammy Hager. I say unfortunately cause I just found it sleazy and cheesy. Hubby and I love to go out and have a fun time but there was nothing impressive about the place. It was just filled with under aged teenagers and middle-aged folks shaking their somewhat saggy asses. After a bit of dancing, we got bored and ventured outside to sit at an outdoor bar for more drinks. After getting our fill of Cabo San Lucas, we got in a taxi and went back to our hotel. Honestly, nothing much really impressed me about Cabo San Lucas. With the exception of the sunset cruise, there’s nothing that I would go back into town for. I’m pretty much at an age now where I’m just not into drinking into oblivion and bumping and grinding. San Jose del Cabo is a whole different story. While Cabo’s main center is a mall with no soul and a marina littered with aggressive salesmen, San Jose del Cabo has a charming historic downtown with a main boulevard running through it. The whole place is like a sleepy colonial village. We walked over from our hotel, going down Boulevard Antonio Mijares, the city’s main artery that is lined with shops and restaurants. While a lot of Cabo San Lucas’ businesses sell tacky goods, San Jose del Cabo has quite a bit of very classy boutiques and fancy restaurants. At the end of the boulevard is the city hall, town square, and historic church. 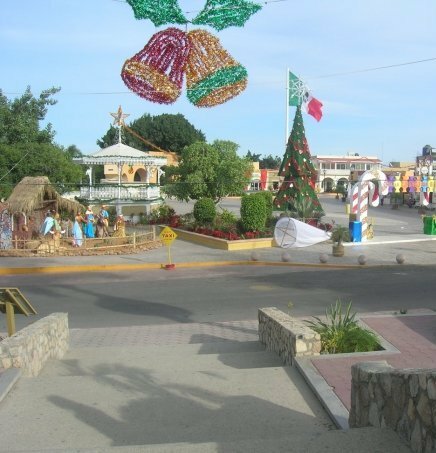 The whole area was decorated with Christmas ornaments and there was even a Jesus display. 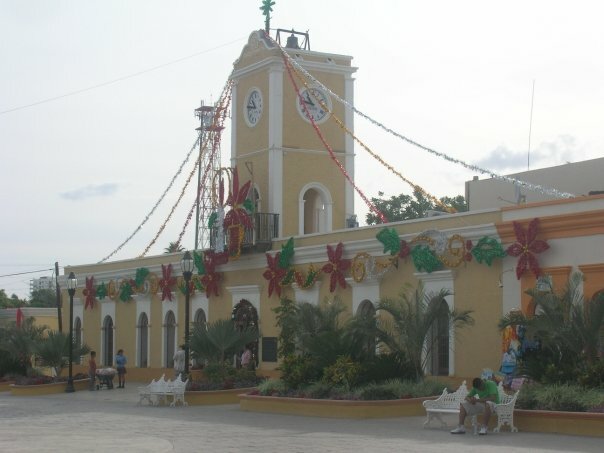 Behind the church is San Jose del Cabo’s art district. You can walk along the different streets, finding one art gallery after another. Hubby wanted a drink so we went over to Shooters Sports Bar. Located on the upper level of building that houses Tulip Tree Restaurant, it’s your typical gringo-friendly sports bar. It does have one redeeming quality, which is that it’s open air so you can view the happenings of the city below you. We spent quite a bit of time there, just sitting and watching people come and go. Every so often, a rickety bus (more like a run down van) would drop off and load passengers. I always wonder how people are supposed to know where to catch the bus in towns like this, as there are never any sign posts. At the end our service, the waiter presented us the bill stuck in a book scrawled with messages from past diners. Many other people had obviously enjoyed their night at the restaurant as we had. It was a very romantic way to end the night. The rest of our time during our vacation was spent on the beach and the resort. 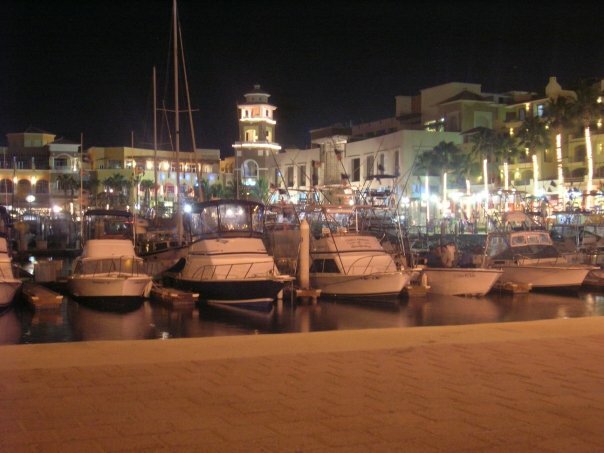 Overall, I absolutely loved Cabo Azul, the sunset cruise, and charming San Jose del Cabo. So beautiful! This place is unbelievable. We spent our honeymoon in San Jose del Cabo. 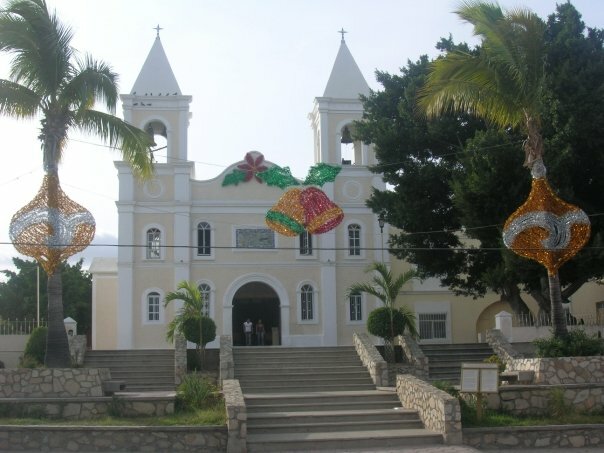 San Jose del Cabo Tourism, be it with your family or with friends, is a unique experience. We were completely blown away by the beauty of the sea, the warmth of the sun and the breathtaking sunsets. Hotel Booking in Mexico is quite easy and can be made online. Hotels are beautiful, comfortable and have a magnificent view of the pacific ocean. Definitively, it’s heaven on earth. Fireworks, the sea, the sky at dawn… it was a dream honeymoon! !